Im a Fan of Phoenix Tattoo and Wellness Center... Are you? Fill in the below form and you can recommend ‘Phoenix Tattoo and Wellness Center’ to a friend or family member via a text message. Show your support with a quick share of ‘Phoenix Tattoo and Wellness Center’. I still love my little Autumn leaf tattoo on my ankle that I got there 3 years ago! My daughter’s name is Autumn and I wanted a tattoo of a maple leaf and they were able to just make up a tattoo from a picture printed off the internet! I just walked in on a whim and walked out with exactly what I wanted! Rhiannon was great to work with! Great artist everyone makes you feel like a friend right down to Dean the resident greater. Try it you’ll like it. Total professionals. Super clean. First time customers put at ease and made into lifetime customers. I am a huge fan because I have the best tattoos from Rhiannon and Brooke. Wonderful work and very professional. I also have had other experiences with them and will always recommend them as great artists. Excellent work, comfortable environment and lovable artists! Great experience! You couldn’t meet a happier, friendly and talented group of people. They are dedicated to the whole experience no matter what service you get. And, they have a really adorable shop mascot! They are a group of well talented people. They are experts in their field and treat their clients with respect. Because she gave me the best tattoo. She and her whole staff were amazing!!!! Service is top notch and the final product beat my expectations! DEF going back! Amazing artists, clean studio, variety of services available. Had my first tattoo ever there and would definitely go back! The staff are a wonderful bunch of people. The environment is relaxed, friendly, and professional. Plus, they have the cutest guard dog! Great people working there! Great work! Really nice atmosphere! I am a fan because the people who own/work here are awesome, fun, nice and wicked talented! They are a phenomenal group of people…totally awesome! ! I have gotten several tattoos here including my full color sleeve. Besides having amazing artists that have incredible talent, they make you feel so warm and welcome there. This place has such positive energy and is just an amazing business. I’m a lifelong customer, although it feels more like family! The owners and staff of Phoenix Tattoo & Wellness Center are not only incredibly talented artists, they’re honest business people whose integrity and knowledge are first rate! The people that work and run this business are such wonderful people! They are very knowledgeable and talented in every aspect of the business!! Rhiannon and her employees are very professional and experienced. She has worked very hard to get here and deserves any accolade she is nominated for. They also offer way more than just tattoos…a fantastic all-around business. 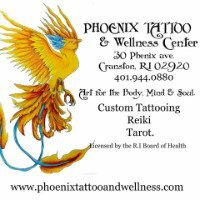 Phoenix Tattoo and Wellness is the best tattoo parlor in Rhode Island. The establishment is super clean and well organized. Their experienced artists are seasoned professionals who go above and beyond to please their customers and their wellness center offers a truly unique experience in a relaxed atmosphere. 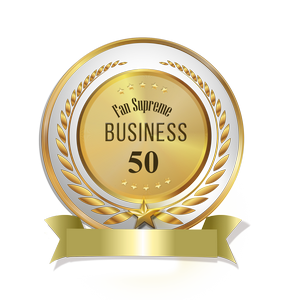 I have been client for over 5 years..They are overall a great group of people. They care about the their clients. The people who work there are so friendly and nice. They really make you feel comfortable and at home. Not to mention their amazing tattoo art work. Always wonderful. Artists are talented and amazing. Always fair priced. 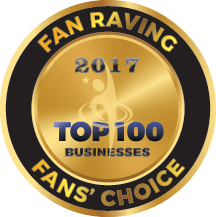 Because I am an owner and my partner and the staff put thier whole hearts into making thisure a great place for our customers! The people there are wonderful and the work they do is amazing! Professional, caring and amazing people!